After washing your hair, do you dry the hair forcefully with the towel? In fact, we should use a large towel to wrap the hair, then gently press and slowly dry. 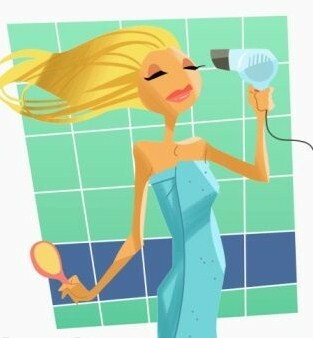 In order to dry quickly or want to “blow” a puffy style, many people turn the hair dryer maximum blow. This approach put the hair under great harm. If you do it regularly, your hair color would be eliminated, or even become dry like brown. In fact, you do not need a hair dryer (but don’t catch a cold). If you want to use the hair dryer, do not turn to the maximum air. Breeze slowly would be better. Have you ever thought maybe Dry Shampoo no need to dry hair at all, when you don't have time? Fáciaño Dry Shampoo is a great tool for clean, nurture, and style your hair quickly at the same time. You often work hard without sleep? Stay up late cause harmful effects to the body. If your body is tired, the hair would not have enough nutrients to absorb. The hair is getting less shiny. The long-term squeezed brain would cause the baldness problem. Therefore, regular rest and good sleep are good protection for hair. Hair dye and perm would influence the hair. It’s better to wait for two weeks to dye after perm. Doing two things in a short time would do greater damage to the hair. If perm fails, do not try to immediately perm again. The chemical would do double stimulation for both scalp and hair. Dry shampoo helps extend the perm life too. On the diet, hair growth requires timely supplement of alkaline foods, such as tomatoes, carrots, oranges and so on. Excessive protein intake would cause the blood circulation towards acidity, which will affect hair growth. Do you comb the hair often? Comb forcefully to remove the dandruff? Combing should be less, and the comb should be gentle to avoid scalp skin cells fall off. Please use the shampoo for your own hair. Use the same kind of shampoo for whole family might be more convenient, but hair thing is personalized. Dry, oily, different hair after perm, everyone should choose different shampoos. Usually shampoos are stated on the package for whatever kind of hair. It is recommended to pay attention next time you buy. In addition to shampoos, conditioners play a protective function. Conditioners in fact can be positive charge electrostatic reactions on the hair shaft, and can reduce the friction among the hair shaft. It makes hair easy to comb. In addition, conditioners can promote hair cuticle phosphonium crumbs attached to hair shaft. It also moisturizes the hair shiny, repairs broken hair cortex and medulla parts. The conditioners play a considerable role on hair care. 1. Instant conditioner: Use it immediately after the shampoo, stay on for five minutes, and then use water to rinse it. This product is only a slight conditioner effect, makes hair easy to comb. It has limit ability to restore the hair. The majority of home and beauty products are mostly used like this; such products are suitable for slightly damaged hair, to increase hair moisture. 2. Deep conditioner: it exists as a cream and stay in the hair for about 10 to 30 minutes. Use hair dryer or warm towel to foment; such products are suitable for chemical damaged hair. 3. Indwelling Conditioner: When towel dry the hair, put this kind of conditioner in the hair. Such products contain only minor heat injury prevention function and thickening agents. Those functions can form a thin membrane on each hair shaft to make hair diameter increased slightly. It can make hair light and easy to organize; applicable to prevent hair dry and damage. The hair would become easy to comb and hair styling. 4. Conditioning Shampoo: This can be separated as two types- clean type and cream type. These two types are to be used right after the shampoo, and clean away before it gets dry. The clean type is made with lemon juice and vinegar. It can remove the calcium and magnesium ions, and also can revive the hair with neutral PH value, shine, and easy to comb. It’s good for oily hair. Cream type is to use 4 levels positive quaternary ammonium surfactants. Its hair care effect is weaker, suitable for oily or normal hair who can make the hair easier to comb and remove soap residue left behind. If you don't have time for shampoo conditioner, Fáciaño Dry Shampoo is a good idea both function. Human hair and scalp is actually quite fragile, so be sure to pay attention to cleanliness and protection. Eighty percent of people do not know how to properly wash your hair. The steps of shampooing are four: preliminary wash, official wash, conditioner, and dry hair. First of all, ready to wash. Preparation is to rinse hair with plenty of water. The purpose of doing so is to wash away the dust, dirt, and dandruff on the hair. It can reduce the use of shampoo, to reduce damage to the hair and scalp. In the salon, this step is skipped sometimes because you sit at the chair while washing. The next is official wash. We must use the official shampoo to clean. How to put shampoo onto the hair, there are some ways. Usually the stylists put the shampoo directly on hair. This way could cause the shampoo concentration too high and not easy to wash away. There will be a long time scalp injury, even the head parts of the hair get much sparse. The correct way is to pour shampoo in your hand, and then drop some water on it. Rub gently, so it starts foaming. And then apply on the hair (not scalp). Please spread evenly to avoid high concentration on any certain places. Do not wash your hair with your fingernail grip. Apply your finger pulp portion to avoid damage. If there is inflammation of hair follicles on the scalp at the same time, less likely to cause more severe infections. Hands are jagged or circular motion to wash your hair, so you can achieve massaging the scalp and promote blood circulation purposes. Wash thoroughly after, and then use a lot of water to rinse off the shampoo completely. Some people think that hot water has greater dissolving power; they use hot water to rinse hair. Do not forget the hot water would hurt the scalp. If you fear of shampoo residue, wash several times with warm water multiple times. No hot water necessary. The third step is the hair care, which is conditioning. Because in the past shampoo is soap, it belongs to alkaline substances and bad to hair. After shampooing, people usually rinse off these ingredients with conditioner, to keep the hair the most appropriate weak acidic condition. But the shampoos current days are mostly neutral or weak acid, thus it could reduce the outer hair edema, reduce damage to the hair. So now the problem is not the shampoo PH value, but the strong cleanness. It cleans all of the hair grease including must-have oil. Now the purpose of conditioner is to complement the oil being washed, to increase the shine, and makes hair easier to comb. Conditioners are used as follows: Take the right amount of conditioners on the hands. First from the hairline, begin to spread from the hair under the ear to the end. Try to spread evenly. After finishing the smear, flush with plenty of water until the sticky feeling disappears. Point to emphasize here is that we don’t need to condition every time after shampoo. Conditioning too much would cause the hair greasy. You do conditioner only when over blowing and styling the hair, the temperature and humidity is very low in winter. You do only when the hair is damaged. Some people wonder, isn’t there 2-in-1 shampoo & conditioner? Why should we take two steps to clean and rinse? Actually shampoo is to wash out the oil; conditioner is to supplement the grease. Two methods are totally different. If we mix together, how do we expect this shampoo would automatically conditioner the hair after the wash? The most likely scenario is both not wash cleanly nor rinse entirely. So it is best not to take the trouble to do two steps apart. The fourth step is to dry. Hair just washed is most susceptible to damage, so we have to blow dry the hair as soon as possible. First, use a towel to absorb off excess water. The method is to wrap the hair with towel, gently pat, do not rub hard or rub the hair together. Then use a hair dryer to dry hair, the temperature should be set at a low point, the wind is set to be weaker. The dryer is as far as possible to be away from the head, and shake slightly to avoid the same place blowing. Use the other hand to flip the hair, so wind can blow underneath the hair. Make the scalp can be sufficiently dried. In addition, the hair comb also needs to be paid attention. Try to use the wider gap and blunt head comb, so as not to damage the hair and scalp. How often should you wash hair? The times of washing from once a day to once many days are all fine. It depends on if your hair is oily, you daily exercise, the environment, your hair style, and if you scalp has skin problems. If you have oily hair, exercise everyday, the life and work environment is dirtier, you need to wash hair everyday. Otherwise no need to. Some people worry washing too much could cause hair lose, it could be. It is suggested that there is daily shampoo harm. However, if the hair is really too much oil, you may have to check whether you have women with polycystic ovary syndrome or strong adrenal function, to cause the sebaceous gland function is particularly enhanced.